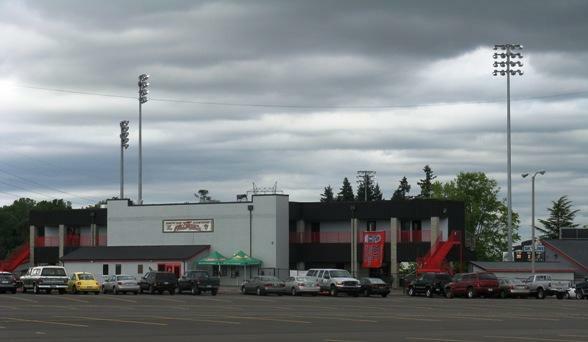 The outside of Vocanoes Stadium. A bit different; but not bad. Parking was free; getting to the stadium was easy. There was a small gift shop (structure to the left of the green umbrellas). Remains of the 4th of July celebration. Nice green field. Red seats, sun-bleached pink. Although this photo looks like weather might have been an issue at this game, it wasn't. It was pleasantly quiet; music is played but not too often. It was sweetness to my ears. Kudos to the Volcanoes organization for doing the music level correctly. 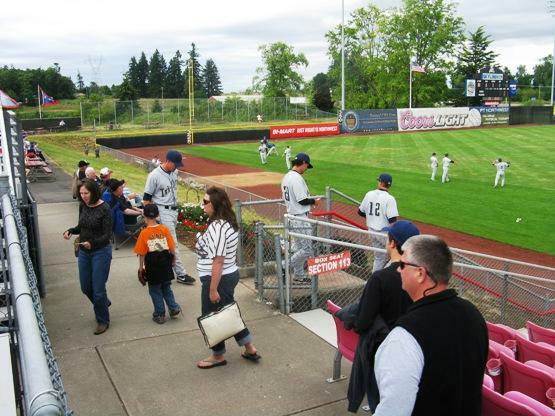 One unique feature at this stadium...the visiting team players had to walk on the concourse to get down to the field and the dugout. Three Tri-City Dust Devils players are walking the concourse and decending the steps here. The stadium had two levels with a concourse separating the two. Bullpens are on the field. We were treated to a beautiful sunset after the game.